Last week was a pretty busy one. I was caught in a lot of very practical, grounded, action-orientated energy. Stuck perhaps in that "day job to pay the bills" type cycle. I was working with a lot of men in power positions and let's just say there was a lot of masculine energy being thrown around. I am learning the value of trying to keep things in balance, so in the down time in between the action, I read Daughters of Copper Woman, by Anne Cameron. One of my editors talked to me about this book a few months ago. She told me she had been reminded of Cameron's book when she first read Sweet Shack and Bach Bar http://pixiedusthealing.blogspot.ca/2012/02/sweet-shack-bach-bar-book-review-from.html She was surprised I had never even heard of this book. Apparently it's a classic. Although I am a writer, I am not very literary. I read books that jump out at me http://pixiedusthealing.blogspot.ca/2012/05/wanning-moon-in-aquarius-violet-flame.html or for pure entertainment. If I don't like a book, I've learned to allow myself to stop reading it. I try to be "literary" sometimes. I have copies of Pride and Prejudice, Sense and Sensibility, War and Peace. I keep these copies in our family emergency survival kit. I teach people they should have these kits made up in case of an emergency. I suggest they include, along with all the practical items like food and water, flashlights, a radio and spare batteries, small (non-electronic) games or books that might keep you amused during long stretches of power failure or during evacuation. I put those paperback books in there for myself. I figure that's the only way I'm ever going to read them! That's the balance thing. However, when your editor mentions a book to you, and then even lends you her copy, I figure you should read it! I opened this book up with great expectations of entertainment. When I first started it I struggled a bit. It wasn't quite capturing my interest and I didn't "get it". I let it sit for a bit. This week I picked it up again and was hooked! Couldn't imagine why I wasn't that impressed for the first couple of chapters. Daughters of Copper Woman, is the story of creation according to Native American mythology. Cameron wrote the stories as told to her by women who believed it was time to let the secrets free. The book was published in 1981. Perhaps that was the first time, they believed it was both safe and timely to share the secrets of the Secret Society of Women, a powerful group within their culture. It turns out Anne Cameron has written over 30 books, including the award winning Dreamspeaker, first written as a screen play and made into a movie. 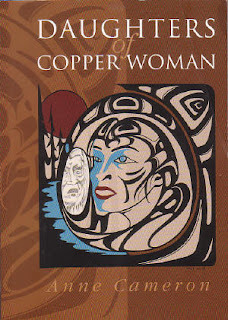 This website for Copper Woman http://www.rahoorkhuit.net/goddess/goddess_quest/copper_women.html describes the book in detail as well as some of the others she has written. I'll be looking for Dzelarhons, the sequel to Daughters of Copper Woman. Maybe underground classics are finding new growth. Maybe it is through seeds that were planted in 1981 when this book was first published that we enjoy greater understanding of who we are and the power of balance today. I hope we no longer need to keep that secret. I'm pretty sure this book was talked about when it first came out. I rather imagine groups of women enjoyed the company of others and mentioned how they felt about the book. Maybe they shared a glass of wine or two during formal and informal discussions and book reviews. I wonder if it had an impact for Native American women. I wonder if they are sharing Wise Woman knowledge with their children. I wonder if Snot Boy has been let in on the secrets at all? Maybe he has a book to write too? There is so much to be learned from this book that I believe can be used in the hear and now. It is defiantly a book worth reading. I will be buying my own copy once I return mine so I can share the secrets too. It's the kind of book that deserves to be read slowly, in pieces so you can absorb the information and then go back for more clarification once you have found your own truths. And that's the power of Wise Woman knowledge: to apply old wisdom to new issues.